1937, the week of feverish rehearsals that would end with Orson Welles performing the most celebrated stage production of Shakespeare ever. I'm an obsessed Orson Welles fan (He's the greatest Director that ever lived after all), collecting all his films and re-buying them repeatedly when a better quality release comes along. 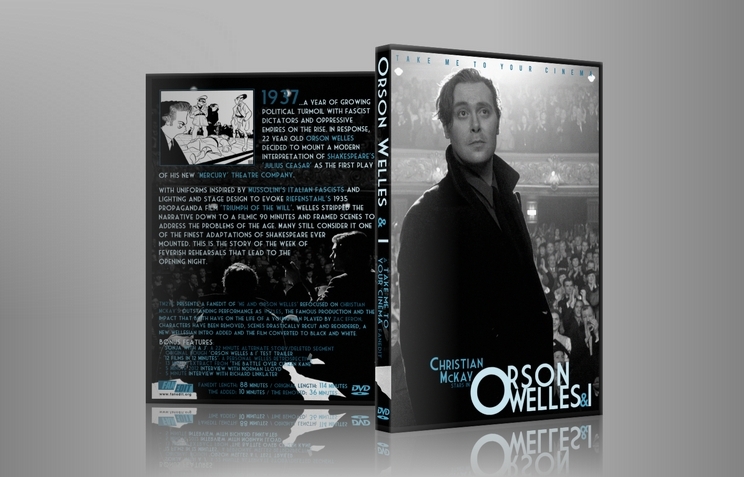 So 2008's 'Orson Welles and I' sounded like a great idea. A film chronicling the final week that lead to his New York production of Caesar (A show that put him on the cover of Time). A staging with modern Fascistic dress and lit like the Nuremburg rally (A recent event in 1937), it was designed to take Shakespeare's play and fashion it into a warning about a world already slipping toward world war. 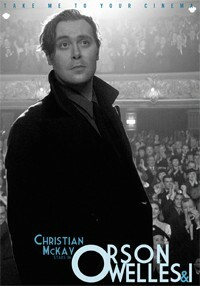 But while the scenes devoted to this play were perfection with Christian McKay delivering an astonishing performance as Welles, it was fatally flawed. Because about a third of the film was focused on a romance between two fictional characters played by Zac Efron and Claire Danes, that had nothing to do with the reality of the situation. So that Orson didn't even get top billing in a film about him! It was my intention to make 'Me and Orson Welles' much closer to the kind of film a Welles fan like me would want to see. I've done this in three ways; Converting it to B&W as we never saw young Orson in colour, removing the romance subplot entirely and by slipping several Wellesian nods into the intro and outro of the edit. I've also added a 1937 newsreel as a prologue, to set the play in it's historical context. The new title is of course in reference to the great 'Withnail and I'. I've endevoured to compile a genorous and interesting collection of related DVD extras for Welles fans. Thanks of course to Welles himself, to Director Richard Linklater for re-staging Caesar in such detail and to Rogue-theX for contributing a stunning widescreen RKO animation. Thanks also go to those that have offered feedback and suggestions in the thread. - All mentions of Richard's have been removed (The real guy was actually called Arthur), he is now just "I"
- Several scenes have been resequenced and drastically recut to change there meanings e.g. I had been hesitant to watch the original movie for a while, and I was excited to see this fanedit. Once I finally bought the original I sat down to watch it... and turned it off halfway through. Yeah, I could immediately see the potential for something better. Thankfully, TM2YC's version is miles above the theatrical. He remind us that not every movie needs a Hollywood boy-meets-girl story for the sake of having it. The editing was perfect and the B&W looked excellent. And all the extras were icing on the cake. Highly recommended. The opening newsreel stuff feels interminable. Seven minutes? This may be "world building" but I would think that there has to be a better way to go about it. I desperately wanted to fast forward during this part but was afraid that there would be things in the newsreel that would come back later. The voice-over(s) do not sound authentic to me at all. The audio quality is too good for the picture quality that goes with them. I'm sure we're to recall the opening of Kane with the screening room scene that follows but I'm not sure why the V.O. about Caesar is laid over it. Are the lips supposed to be synched with V.O.? Once we get past the opening, things go very smoothly. Though Zac Efron is ostensibly our foil, he's very much a cypher, kind of like the reporter from Kane, though much more visible. I found myself not caring about his home life by any stretch nor about the girl from the music shop he kept running into. If this movie could be made without him altogether I would not weep. Christian McKay plays a good Welles. I was thrown off at first by his mania and that "we're all so wacky because we're theater people" vibe through the first third of the film. Luckily, that calms down a bit as we see a little more of Welles's humanity. I didn't notice anything missing from the film -- it all played smoothly and felt very natural. If I could make one suggestion it would be to remove the prologue completely.